Tiramisu; literally "pick me up" cake. Most of us are familiar with this classic Italian dessert. If your a coffee lover, this is the dessert for you. Layers of espresso-soaked lady fingers and a sweet mixture of mascarpone cheese, eggs and sugar. This is my version. I have this on my catering menu and it is one of my most requested desserts. Who can resist a chocolate, coffee cream dessert? These are bite size cakes, perfect for a cocktail party or a simple get together. Preheat oven to 350 degrees F. Spray mini-cupcake pan with non-stick spray. In a medium bowl, mix cake mix, sour cream, egg, water and espresso powder. Beat on low speed until incorporated. (mixture will be thick), about 2 minutes. Fill with approximately 1 rounded tablespoon of batter into mini-muffin cups. Bake for 8-10 mins. 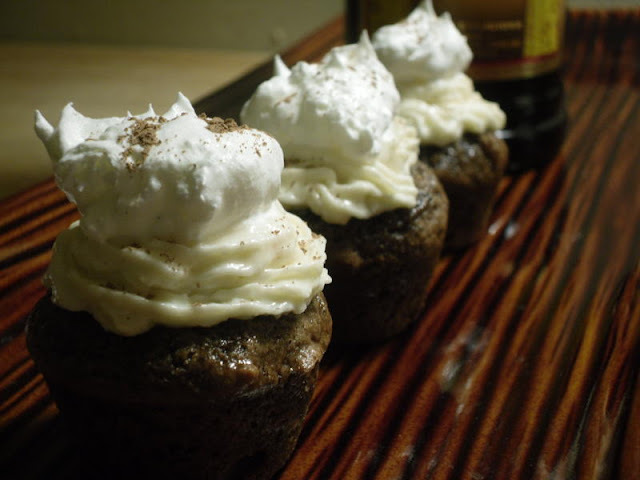 While cakes are still warm, brush with coffee liquor until all liquor is finished. Let cool completely. Mix mascarpone cheese with sugar and vanilla. Fill piping bag and pipe cream cheese frosting onto each cupcake. Dollop with whipped cream and dust with cocoa. Tiramisu is so perfect! Thanks for sharing your recipe! Would it be possible to omit the chocolate liquor in this recipe - would it still be great? Oh how could this be anything but wonderful??!! Yum!